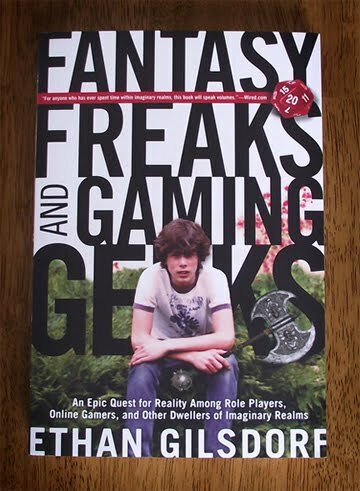 In Fantasy Freaks and Gaming Geeks Ethan Gilsdorf takes on the role of fantasy anthropologist, studying the various tribes of geeks and gamers lurking on the edges of "normal" civilization. A pop culture and travel writer, Gilsdorf journeyed across the U.S. and Europe to meet Tolkien Society members, D&D developers and players, live-action role players, Society of Creative Anachronism citizens, World of Warcraft gamers, costumed convention goers, Kiwi LOTR tour guides, and a French dude building his own castle. The book explores the realities and the common assumptions made about fantasy nerds. Along the way the author examines his own relationship with the fantasy world and it's affect on his life. It's a fun and enlightening read. Leave a comment on this post. Be sure to include your name (first name and last initial will do). You may also enter by sending an email to: andrew [insert at symbol] ferrouslands.com I will stop accepting entries after 12 noon Mountain Time on January 10, 2011. I will randomly pick a name from all the entries and will announce the winner in this post (so be sure to check back here after the 10th). Once the winner sends me his mailing address I'll ship it off to him via USPS Media Rate. If you live outside the US, then you will need you to pay for the shipping cost. If I don't hear back from the winner within 4 days, then I will pick a new winner. That´s really kind of you mate to do that. Sounds like an awesome book. Sounds like an interesting take on the subject. Nice blog... sign me up for the raffle! Sounds interesting and like a good read. Sounds good. Thanks for the opportunity. 18 people entered including those that sent emails. Congrats Tom W. Email me your address to receive your signed copy.